Everyone is worried about debt. Government debt, household debt, personal debt, corporate debt. We are in it up to our eyeballs and often beyond. Debt is not always bad, though. The financial system can’t survive without it; banks and traders need debt to finance growth. As usual, the key is moderation. Debt can be good if it helps a person grow their business... or invest in a good education. Well, at least that’s the theory. 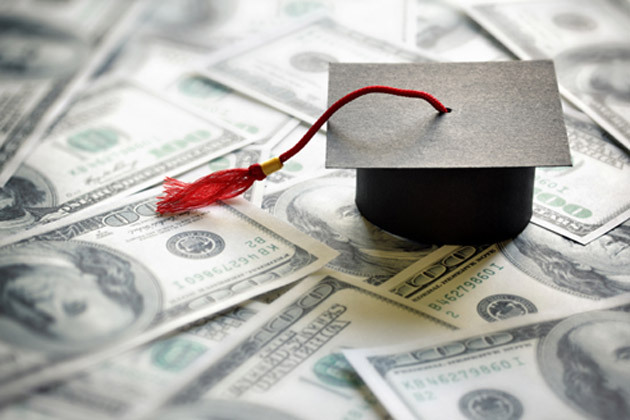 Student debt should be productive—after all, it buys education that enhances your income. Yet for millions of Americans, that’s not what has happened, and the reason may surprise you. Before we get into the details, let me quickly suggest you invest (debt-free) in another kind of education: a Virtual Pass to next month’s Strategic Investment Conference. For the first time ever, the Virtual Pass will include video recordings of every presentation and panel from the SIC 2018. Even better, if you have some free time when the conference is happening, March 6-9, you can watch it live on your computer or mobile device. The Virtual Pass includes some other nice benefits too. It’s the next best thing to being with us in San Diego, so check it out here. 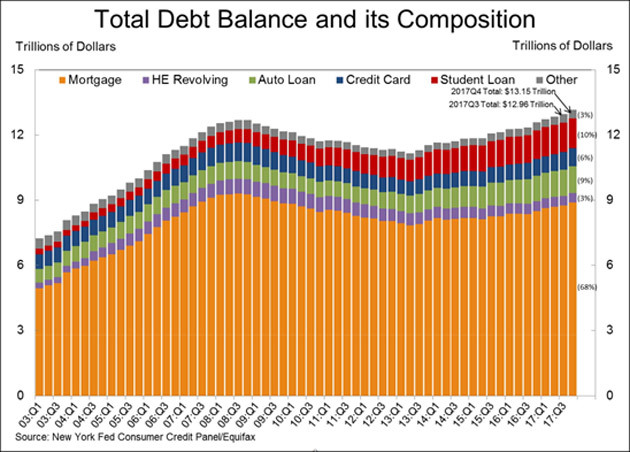 The New York Federal Reserve Bank publishes an always-interesting Quarterly Report on Household Debt and Credit. The Q4 2017 version came out last week. Collectively, Americans carried $13.15 trillion in debt as of year-end 2017. As you can see, most of it is mortgage debt—about 71% of the total if you include home equity loans (“HE Revolving” in the chart). Surprisingly, the next-largest category isn’t auto loans or credit cards. It’s student loans, which are now 10% of total debt. Their share has been growing steadily. This might be okay if the debt enhanced the student’s financial security, but often that’s not the case. Millions of borrowers don’t achieve the desired results but remain stuck with the debt anyway. It’s actually worse than that. 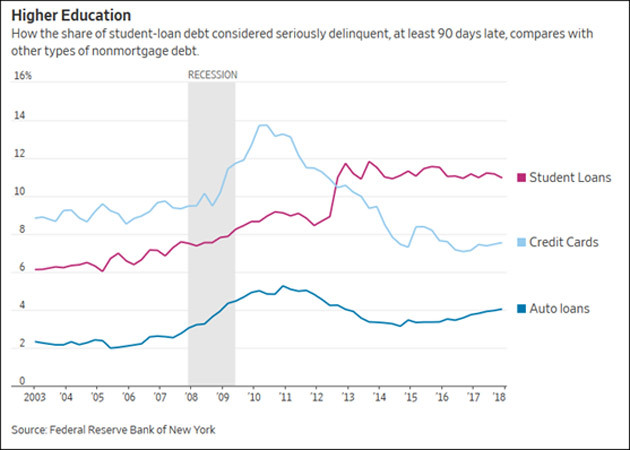 Roughly half of student debt is held by borrowers who aren’t required to make payments yet because they are still in school, unemployed, or otherwise excused. Much of that debt would likely be delinquent too. It’s because employers require a degree as job qualification... and that’s partly the fault of IQ tests. Furthermore, the court said employers had the burden of proving employment tests were necessary for business purposes and not racially discriminatory. That’s hard to prove, so many US companies stopped using pre-employment tests at all. If you want first-hand insights and actionable ideas from these leading experts and 20 others, this is your opportunity! Colleges: Raise prices since so many students were begging for degrees. This made college more expensive, forcing students to borrow more and more money. Politicians jumped in to promote and guarantee those loans. And here we are. 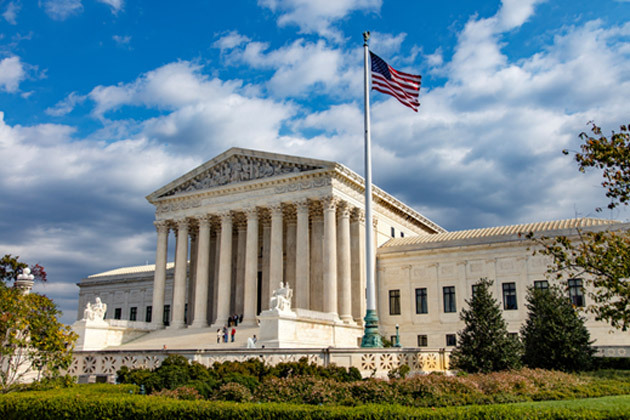 In the Griggs case, the US Supreme Court effectively granted colleges a monopoly. They can discriminate based on testing—or really a long series of tests that lead to a degree. Employers can’t. After discussion with several others, we conclude that there is NO incentive to fix this problem. The lenders will package the loans (some good, some so-so, several clinkers) and sell them, and the buyers will re-sell them, and ... All with the expectation that the good old taxpayers will bail them out. The lenders will blame the students and the legislatures will blame the lenders and students. Thus, although there may be ways to improve the process, none will be acted upon. Feb. 20, 2018, 4:25 p.m.
Feb. 20, 2018, 1:07 p.m.
Debt is not a requirement for getting a college degree. It is a choice. I would be more likely to hire a grad that worked to get through school debt-free (commitment, time management, focus) than a heavily indebted grad with less life and work experience. And imagine the head start the debt-free grad would have in earnings, savings, and investment. Great column! Feb. 20, 2018, 11:08 a.m. This is just another one of the situations where companies have off loaded some of their cost of doing business(health care, pensions etc.) to someone else. From what I can see, most don’t want to train anyone anymore so the government or private individuals take on that burden. Having worked most of my career during a time when companies did those things, it seems to me that it creates more of a dependence between the companies and the workers. Workers don’t want to give up the benefits they’ve earned and companies don’t want to give up on workers who they have poured some resources into. As one educator said a few years ago, if you send me someone who can read, write, do basic math and can think critically, they can be trained for all sorts of jobs. Feb. 20, 2018, 10:05 a.m.
Patrick, 3 more major areas. 1) Can a high school (middle or elementary) teacher really tell a student the truth? (As in you have the skills expected of an 8th grade student in HongKong) No. Why? Because (a) the student has done fine until now, (b) if he really knew the truth, he might disrupt your class (c) so it’s easier to just pass the student with a 70. How do I know? I used to teach - and when I told student the truth - I heard it from parents, administrators and “downtown.” No one wants the truth. If you tell the truth, you are the problem, and they will gently push you out of the picture. 2) This leads to problem #2. The kids THINK they have been successful in high school, and college sounds like fun - and ALL the cool kids are going to college, and you don’t have to pay. Why wouldn’t a less-than-successful student go to college. Besides, they have these cool classes called “Entry Level Math” and “Entry Level English” So, you can catch up easy. Why in the name of Heaven, we (the taxpayers foot the bill) would pay someone to learn their high school subjects, when they were not successful on the entry level exams, is beyond me. 3) Someone paraphrased Chris Rock recently: “Noting that the kids were told, “You can be anything you want to be,” he thought, “Why are you lying to these children? Maybe four of then can be anything they want to be. But the other 2,000 better learn how to weld.” He imagines a more truth-based approach to pedagogy: “You can be anything you’re good at, as long as they’re hiring. And even then it helps to know somebody.” We are telling kids that music degree is the path to back-up singer for Taylor Swift. Not. So, in short, as long as we have these three drivers, the very predictable student loan problem isn’t going away. And it will become more costly. Solution? 1) Your high school graduation is not “ready for college.” That’s on you. If you didn’t do your homework in high school, you probably won’t do it in college. If you fail the entrance exam, you are not ready for college. period. Save your time, and the heartache of paying for student loans. But you won’t get the truth from your teachers or counselors. Sorry, that’s the (lying? not-the-truth?) system that parents have demanded from your school board, school administrators, teachers and counselors. 2) Were you in the top 50% of your high school class? You. Are. Not. Ready. For. College. Sorry, but no one else is telling you the truth. (high performing schools aside). Generally about 35% of the population earns a degree, and more than generally, these are from the top 35% of the high school graduation class. Look at the numbers. You should probably go to a trade school. Either you don’t have the work ethic (If you never learned to do your homework, the homework fairy doesn’t come along in college, and you magically start doing your homework), or perhaps your brain isn’t smart enough. You should pay for that out of pocket. 3) Kids CANNOT be whatever they want to be. We gotta tell them the truth. In one of my classes with 24 students, here was the breakdown: 3 Pediatricians, 2 Vets, 1 Orthopedic Surgeon, a Dentist. Honestly, I almost cried. In this same group, only 3 were accepted to a smaller state school. The rest were aiming for the local community college. And of those kids, 1 passed the entrance exam and did not have to take remedial classes.